Leah Embley was the hero as Burnley FC Women secured their first win of the season with a 3-0 victory at West Bromwich Albion Women in the FA Women’s National League Cup Determining Round. The winger’s second half brace added to a first half own goal, to secure the Clarets’ passage to the next round of the competition following a dominant display in the Midlands. Burnley FC Women travelled to their counterparts for their first away fixture of the new campaign, hoping to build on the positives from last week’s draw with Leeds United. On a warm, sultry day, it was the home side that started brightest, coming close to scoring inside five minutes from a ball over the top, only to see the ball go wide of the near post. This sparked the Clarets into life, and soon Embley had her first chance of the game, but was unable to open the scoring. Katie Halligan and Lizzy Hamer also pressed at goal in the early stages of the game, whilst the hosts’ biggest threat looked to be down their righthand side. The deadlock was broken just after the half hour mark via a well-executed set piece from the Clarets. Captain Jo Holt delivered a freekick into a dangerous region of the penalty area, and an Albion defender was only able to steer the ball into the bottom corner of her own net as young Claret Katie Halligan pressured her. Halligan had the ball in the net five minutes before half-time, only for the goal to be disallowed for off-side. The lead remained at just one goal as the half-time interval arrived. The second half started with Embley looking lively, having moved into a central role, and it took her just over five minutes to extend the lead. The goal came as she was able to steal the ball from an Albion centre back in the centre of the pitch, before racing through to fire calmly beyond the keeper. This sparked some pressure from the home team, who came close to scoring from a corner, but were denied by a smart save by debutant keeper Emily Gibbins down to her right side. The game was made safe with just over a quarter of an hour remaining as Embley’s pace in behind once again was too much to handle for the home side. After breaking through and getting around the keeper, she was able to slot the ball into the empty net, despite the best efforts of a recovering defender. With 10 minutes remaining, Burnley had the chance to make it four from the penalty spot when Evie Priestley was brought down in the area. However, Justine Wallace’s effort was just wide of the bottom corner. 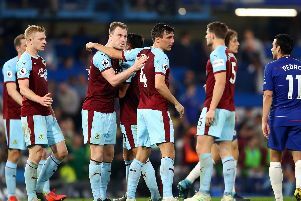 It didn’t matter though as the game ended with the Clarets as the comfortable winners, and progressing to the next round of the competition. They will now look to take the momentum from this win into their National League campaign as they travel to Liverpool Feds on Sunday in search of a first win in the league. That is followed by a trip to Bolton Wanderers on Wednesday evening, and then a home clash with Norton and Stockton Ancients on Sunday, September 16th. Meanwhile, the Burnley FC Women’s Reserve team played out an exciting 5-5 draw against Barnsley Ladies FC Reserves in their opening game of the season. Team captain Rachel Owen scored a hat-trick, with player of the match Georgia Payton and returning youngster Simone Keating scoring one each as the Clarets shared 10 goals.